It was an interesting room with an unusual headphone stand, in-ceiling speaker and another petite Under $5000 rig with Totem Rainmaker speakers on a unique precisely adjustable tabletop stand from Ardan that I have mentioned in a previous year. 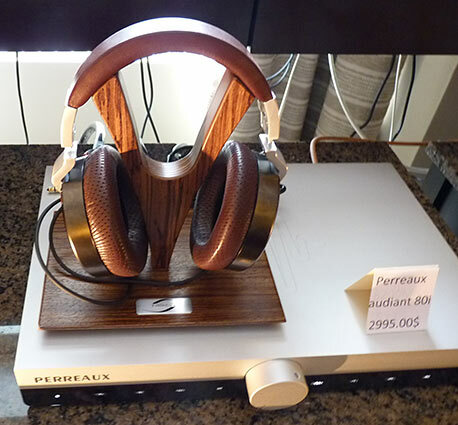 Beneath the headphone was an attractive Perreaux 80i integrated amplifier for $2995. I had not seen this brand in quite a while. The Radio St-Hubert room had music files in a MacBook Pro with an AudioQuest Dragonfly DAC running into an NAD integrated amplifier running into Monitor Audio RX-6 speakers. The host ran a demonstration playing the same cut both with and without the Dragonfly in the laptop and the difference was very convincing � unlike last year (or was it the Toronto show?) where I was less amazed using a headphone to audition the Dragonfly. At some point in the show Linda had a chance to compare the Dragonfly with a decent set of headphones and declared �I want one!� Like a lot of other people, she watches movies in bed with earbuds plugged into her tablet. I better put this on the Christmas list. But I digress. The system here was under $3000, not including cables or the computer, and a very nice way to get into the high end. Sorry, I forgot to take a photo here, but surely you've seen a dragonfly before. Another cool Under $5000 rig was comprised of a laptop (which you already own, right?) feeding into the Naim DAC-V1 ($2300) with 32-bit/384kHz resolution and a very good headphone amp and a volume control in the digital domain. That drove the small NAP 100 power amp ($1200) with 50 wpc into 8 Ohms, 100 wpc into 4 Ohms, which drove a pair of attractive new Focal 807W stand mounted monitors. 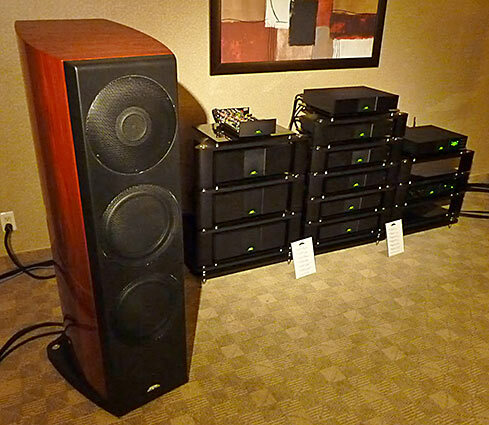 The big rig in the Naim Audio room featured the Ovator S800 loudspeaker (about $60,000) that featured an almost full range driver on top that features some high-tech pistonic motion and does some kind of wave bending to reach higher frequencies above 2 kHz. I noticed it was coupled to the rear of the speaker cabinet. It is called Balanced Mode Radiator and there is an entire white paper about it on the Naim website if you're into technical reading. Suffice it to say, this is their top model. A couple of additional large woofers fill out the bass range. With 89dB/W/m sensitivity and a 4 Ohm resistance you are probably going to want powerful solid state amps with these large speakers to fill out your large listening room, no doubt. Starting in the groove, an expensive Van den Hul Colibri cartridge (about $8000) with gold coils was mounted on the new Funk FXR-II 12� tonearm ($3400) that seemed very thin relative to most tonearms today. This is Van den Hul's finest cartridge and it sports a 0.50mv output. The arm was mounted on an Acoustic Signature Storm turntable ($7500) and the analog signal was sent to a Grandinote Celio phonostage ($8750). The digital front end was the Chronolog CD player from Trigon. Both were fed to the Grandinote Domino preamp ($16,600). The Grandinote Demone monoblocks ($49,000/pair) use special VHD output transformers wound with pure silver and use zero feedback throughout the amp. It is all direct coupled without any capacitors in the signal path. 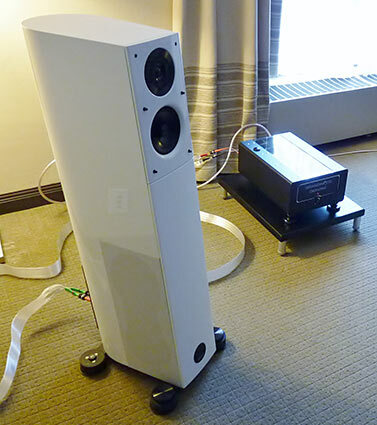 60 Watts, pure Class A resulted in a very tube-like sound. 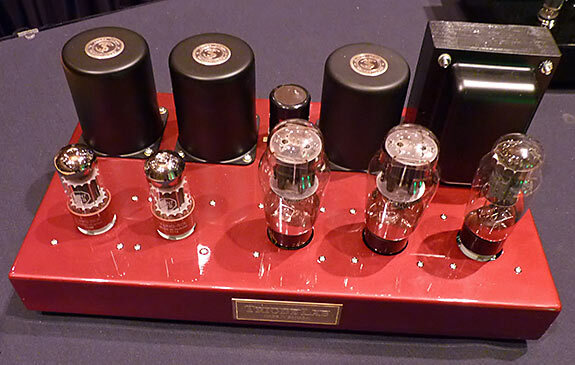 Very unusual to have an output transformer on a solid state amp as Grandinote has done, but the result was exceptional. The Audio Physic Virgo 25+ incorporates some new technology and borrows some technology from the Avantera and fills the gap between the Virgo 25, which remains in the line, and the higher Avantera model. The 25+ sells for $18,000 to $20,000 depending on finish. 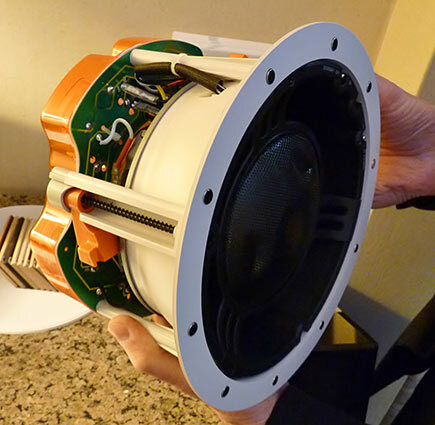 The goal here was not only to fill the large price gap between the two models, but to offer a speaker with higher performance in the same size package as the standard model 25. I noticed the speaker cable was the Nordost ribbon stuff, and wondered if that might have been the reason this rig sounded a little harder than what I heard at Toronto when it used the Onda silver cables. The Calibri phono cartridge is lightning fast and superb, but maybe it was too much truth for this system. I absolutely heard and understood every word Jackson Browne sang on a cut they played from my LP. All in all, it was certainly one of the Best Rooms at the show. As an aside at the end of my visit I was told of the new Grandinote Essenza, an upgraded version of their 37 wpc Shinai integrated amplifier with the same technology as the separates, but in a dual mono single chassis unit for about $16,000 from this Italian firm. That makes for a cool $49,000 savings. Having finished up the rooms on the first and second level, I still had a little time before meeting Tom and Linda for dinner so I headed to some of the larger rooms for casual exploration and to plan the attack for Sunday. 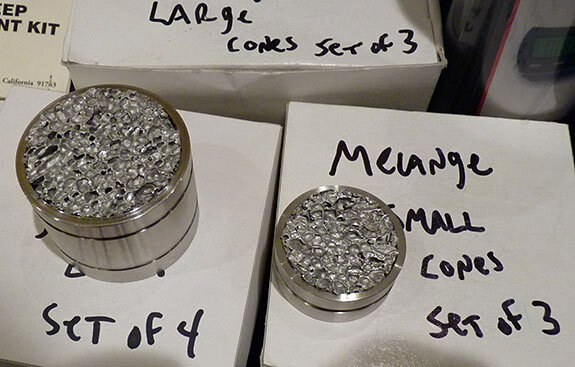 In the Liberty Trading room which is always filled with lots of LPs and accessories as well as an assortment of systems in a shared open space, I chanced upon some footers that utilized frothed aluminum as a dispersion medium for vibration control. I had seen sheets of this material large enough to make shelves, but couldn't track down a source. The hunt is on again. At the top of the elevators the SSI ladies, sporting blue streaks in their hair this year were still on duty. I stepped into the Pavillion du Canada exhibit and immediately spotted three tube amps from Triode Labs from the Toronto area. I have a new 6 wpc model from them just waiting for a new high-efficiency speaker to break in for final listening with their amp. It's a honey. Review forthcoming. Their red power amp shown here is indicative of their no-frills/put the money into the sound approach. 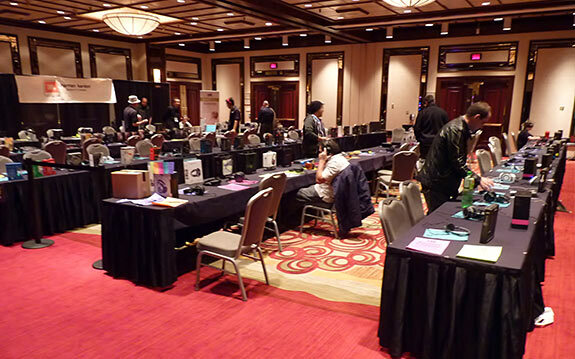 Around the corner I stumbled into the Personal Audio Zone � headphone nirvana. Immediately I recognized that it would take an entire day to cover just this one room, so I plunged in for the twenty or so minutes I had left. Groups of headphones seemed to be plugged into the same source, but that source would change every ten feet or so. Headphones could also be plugged into your phone, too, if that's where you had some of your music � depending upon the size jack at the end of the cord. Eventually I ended up at the farthest corner where the good stuff seemed to be. 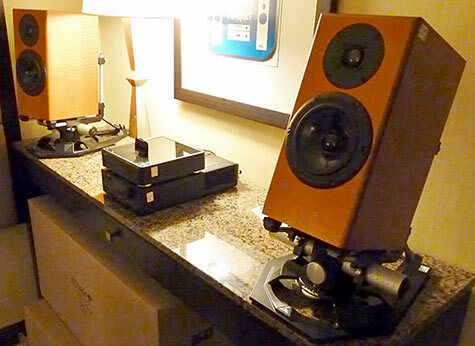 I particularly liked the Woo Audio WA 7 Fireflies tube amp in both black and silver (tough choice) for $999. 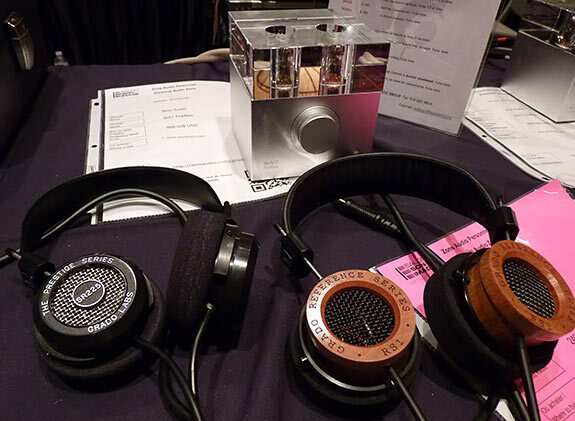 Also a bunch of Grado headphones in a wide price range sounded very good, as they have in the past. There were product sheets with code squares you could zap with your smartphone to obtain more product info on the net � a nice idea, but my phone is so dumb it doesn't work in Canada. Oh, well. 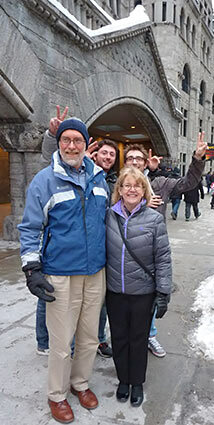 I had a pleasant chat with Robert Deutsch whom I see at almost every Canadian show and then headed back to the room where Tom had already opened a beer and Linda was sipping wine. 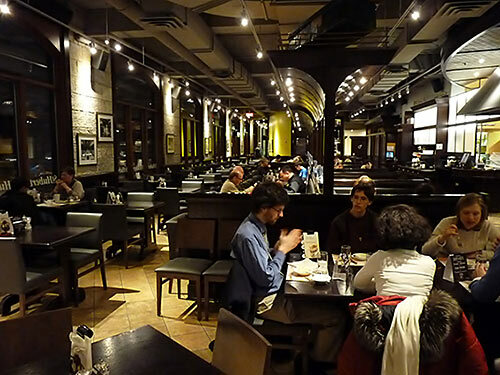 We hit the streets running and headed for the St. Hubert chicken restaurant at the train station. Founded in 1951, it is a far cry better than Col. Sanders. Outside we felt like celebrities as locals jumped into the photo op like groupies. Turns out the Montreal Canadiens (I still don't know why they are not called the Montreal Fur Traders) were about to host the Buffalo Sabres. We didn't mention that we lived 60 miles from Buffalo. After dinner I roamed through the restaurant admiring old photos and architectural drawings that adorned the walls of this vintage building. Back at the hotel a few people frolicked in the pool in spite of the snow that surrounded the deck. Linda dozed off while I had to keep changing channels to stay with the close basketball game between Butler and Marquette. Back at the hockey game, Buffalo beat Montreal, 2-1 that night. In the morning I would tackle the lower level. 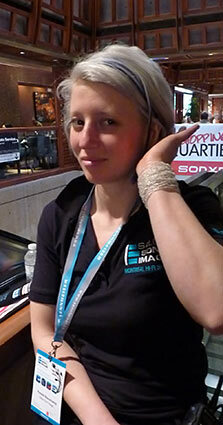 ---> Part 4 of our Salon Son & Image Report 2013 -- Montreal High-End Audio Show page.